Jogging each axis causes the cone (representation of the bil) to move in the display, and at the same time I observed how the machine moved. In AXIS a positive movement in any direction moves the cone towards the letters ‘X’, ‘Y’ and ‘Z’. However on the machine every axis moved in the opposite direction. This meant that I needed to reverse the direction of the motors. The motor direction is reversed by swapping the ‘A’ and ‘a’ wires. Note that this may not be the case for all motors. Check the documentation that came with your contoller board to be sure. Once the motors had been reversed the machine movements copied the movement of the cone in AXIS. The next step was to make sure the machine was moving roughly the correct amount each time. I calculated a configuration (essentially the steps needed to move one inch) for each axis. On the V90 the X and Y axis are 5 threads per inch, but the Z axis is 12 threads per inch. More on how this calculation is performed in a later post. Plugging these values into the EMC2 configuration should do the trick. I then zeroed the position of each axis in AXIS and used a ruler to measure the location of the Z axis assembly from the side of the gantry, which is the distance the Y axis is moved in from the side. I then jogged the Y axis until the display showed it had moved +0.5 inches. Remeasuring confimed that the Y axis had indeed moved half an inch. These steps were repeated for the Z axis. To be sure I also created an EMC2 configuration for the V90 in millimeters and repeated the test. This time I jogged each axis +0.1 x 10 times, to move the axis one millimeter. I decided that the McWire CNC machine probably wouldn’t be able to product the accuracy I need, or have the lifespan that I need for a machine. In addition I want to be able to cut objects up to a square foot in size. The McWire design would need to be four square feet in size to be able to do that. Instead I decided to buy a machine kit. 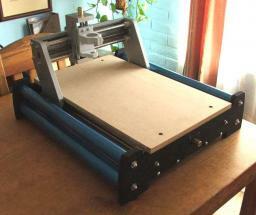 Fireball CNC have just released the V90, which has a cutting area of around 12″ x 18″ x 3″. I was fortunate enough to get one during the beta testing phase. Below is a picture of the assembled machine. The next steps are to extend the motor wires, attach them and test jogging from EMC2.